We’ve decided to pool our money and buy a private island on Flathead Lake. For only $44M we could be so lucky. Twenty-four acre Shelter Island is for sale. For a few dollars less than that, we found a ton of fun places to explore during our June vacation in Northwest Montana. The lake its self is the best thing about this region of Montana. The water is clear, one of the cleanest in the US. 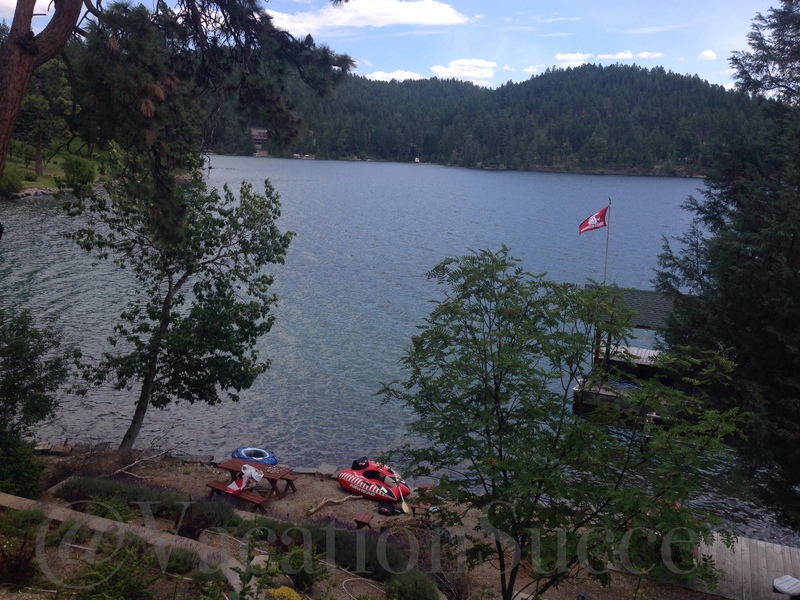 We could see whitefish and lake trout swimming around the dock of our rented lake house, even in deeper water. The kids caught freshwater shrimp and crawfish. The water temp is cold, ~60 degrees the last week in June. Regardless, we swam and boated without complaint. When you got too cold from being in the water, you just found a sunny spot on the deck or dock and let the sunshine warm you up. We had lunch at Kiskas, complete with chicken and waffles. The Southern inspired menu is full of yummy dishes. Try the pulled pork sliders. After wondering through the shops, we ended our afternoon outing with coconut ice cream at Sweet Peaks. A state park only accessible by boat, the island is quite and feels a million miles from civilization. The rocky beach of Seeko Bay wasn’t as pristine as the beach in front of our lake house, but that didn’t discourage the kids from playing. There are a couple of one-mile hikes from that boat landing point. There is a bit of an elevation gain on the hike, and it gets hot, since there is limited shaded. Bring water even though its not a long hike. You walk a dry dusty path past big horn sheep and, if you are lucky, wild horses. 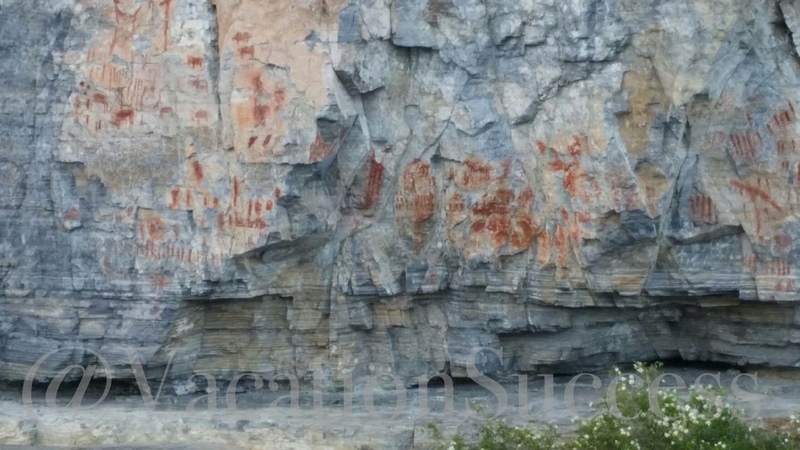 Also only accessible by boat, there are native cliff drawings. 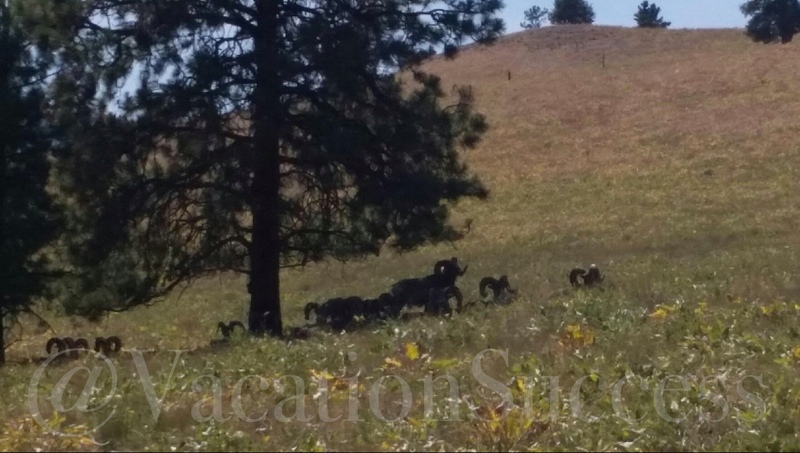 They are near Shelter Island, on a cliff off the western side of Flathead lake. There are several Indian Nations that still call the lake home. Its cool to see some of their heritage preserved. Tiny Lakeside was only seven miles from our lake house. There is a great grocery story, a brewery restaurant, marina with awesome outdoor patio dining. And, a Burt Reynolds inspired police dummy sitting in the driver seat of a parked police car cautioning drivers to slow down as they pass through town. Tucked away on Holt Drive between Somer and Big Fork, is a charming little agate shop. You’ll see their black and white hand-painted billboards on the north end of the lake. Follow the signs to find this gem. The second-generation family that runs the shop are helpful and knowledgeable. They’ll gladly show you precious stones, rocks and fossils from their display cases. We came home with a few new rocks to add to our own collection. We’ll be back. There were plenty of fun things for the eight of us to do during our week-long vacation. Maybe next time we’ll visit in the winter and try our hand at some Montana skiing.